5 Days. That is it. You have 5 days to sell your Moms house or it will be taken by the State of California and MediCal for medical expenses associated with your mothers long term care. Everyday, families are faced with choices that put the assets that they have worked a lifetime to accumulate at risk from seizure by the government as a way to pay for long term health care cost. At those moments its important to line up the resources necessary to protect your assets while at the same time maximize whatever equity the house has accumulated. My name is Peter Westbrook and when anyone is asking “Who Buys Houses in Stockton”, I would like you to remember that I am a real estate investor in Stockton, Manteca, Modesto and Sacramento CA. 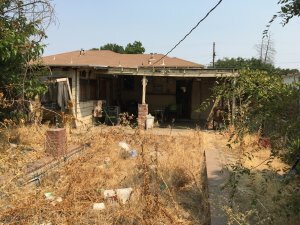 We Buy Houses in Stockton CA in any Condition, we pay cash and this is the story of Audrey and her mother. When the phone call came in I was in Home Depot with a full shopping cart of materials for a house that I had purchased and was rehabbing. I was in the middle of an isle and like many calls that come in, (especially when I am shopping) I have to decide whether to let it go to voicemail or answer it on the spot. That day I made the right decision and I answered the call and on the other end I could sense an immediate urgency. The conversation began: Hello my name is Audrey and I watched one of your videos online about buying houses in Stockton, are you Peter Westbrook? I responded that I was and asked how I can I help? The flood gates opened and in 3 minutes I heard a story that unfortunately I’ve heard before. MediCal had told Audrey that unless her mothers house was sold by the end of the week the State of California was going to confiscate it. She had five days to sell it and she wanted to know whether I would be interested as a cash buyer? She told me that the house was in such bad shape that it could not be sold with a realtor. She said that she had talked to several realtors and two had given her my name so she looked me up online and then called. That’s a lot to soak in in three minutes with a full shopping cart in the middle of a home depot. I decided to do the unthinkable. I explained where I was and what I was doing and that I needed 5 minutes to get to my car so I could focus on the conversation and take some notes. I could tell she didn’t really believe that I would call her back and I assured her that I would. I pushed my cart to the front exit and abandoned it and the hour that I had spent shopping. I headed for my truck and in three minutes the phone was ringing and Audrey answered. She didn’t take a breath and explained that she had called realtors and friends and no one could help and wanted to know what I could do? I explained that I may be in a position to help her immediately, but that I needed a bit more information abut he house in order to do that. We talked about the house and I outlined what would need to happen in order to meet her deadline. We would submit the Purchase and Sales Agreement and escrow number to Medi-Cal for proof of Sale. The title company would order a Preliminary Title Report to determine the condition of the title in order to issue Title Insurance and complete the sale. Audrey was concerned that with everything required we would not be able to meet the deadline. I tried to reassure that while it was going to be close, doing it the wrong way would have the same result of doing nothing at all, so we scheduled a meeting at the house in 30 minutes. 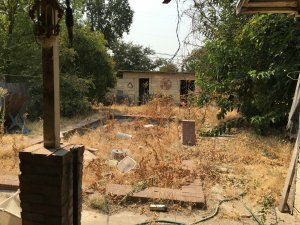 Keep in mind that the house was vacant and vacant houses pose several problems for homeowners not the least of which are break ins, vandalism, maintenance and upkeep, and of course liability from anyone that is at the property. Most homeowners believe that if they only had time to clean up it may make a difference. The real problem is that sometimes the accumulation of items over the years makes that task next to impossible and overwhelming, because what is really need is a dumpster. Within one hour of the first call I had begun walking through the house. She apologized for the mess the entire time, explaining that she would have liked some time to clean up prior to showing it. I explained that I had seen far worse and I wasn’t expecting a clean house. The walk-through took all of 30 minutes. I was able to call my office and get a comparable sales report via email. I called the Title Company for another comparable sales report to verify the numbers I was looking for. The reports validated each other and it became clear what the house was worth AS IS and what it would be worth if it were fixed. We discussed the reports the condition of the house, the nature of the repairs and amount of the cash offer for the house. I listened as Audrey explained the home equity line of credit balance, (a mortgage owed), what she wanted out of the house for her Mother, as equity, and in a matter of 10 minutes we agreed on a sales price. It was really that simple. We drafted a Purchase and Sale Agreement and we both signed the agreement. She took her copy to Medi-Cal and I took mine to the title company. The house was placed in escrow and the first part of her dilemma was resolved, the house was technically sold and that satisfied Medi-Cal. When the title report came back there were issues and a possible probate loomed. Apparently some years back in order to avoid getting on title after the fact, a realtor friend had convinced Audrey to “go on title with her mother” as a way to expedite matters if her mother became incapacitated. The only problem was that she was put on title as “a married woman” and as such her husband would need to sign off on the sale as well as his ownership was now implied per the Grant Deed. Remember California is a community property state. The problem became that Audrey’s husband had passed away 4 years earlier and could not sign off. Since his estate had not gone through Probate there was no way for Audrey or her mother to deliver clean title to any buyer. 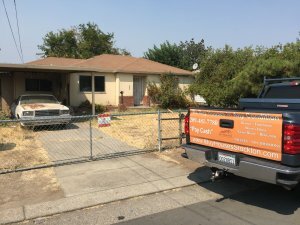 The title company said that the Stockton house would need to go through probate and even as a small estate probate would take a minimum of 120 days. Sometimes its not what you know but who you know and the Title Company had thrown us a curve ball that had the potential to stall the process for at least 120 days. As I discussed the details of the title with the escrow officer I questioned the ownership by the husband because even married women can inherit real property or have it gifted to them without it becoming community property. What made this different? The inclusion of the words “a Married Woman”? At that moment the escrow officer agreed, but stated that as the title company they could not come to that conclusion on their own, it would need to come directly from a court or a well crafted letter from an attorney explaining why the property really never belonged even in part to the husband. Within 1 hour I was in my Probate Attorneys office (it pays to have a team) and after a 30 minute phone call with the escrow office we had drafted and opinion letter and affidavit for the only surviving heir of the father to sign relinquishing any interest in the property. The closing was occurred that Friday afternoon and Audrey requested another week to mover her mothers things out. There are very few real estate transactions that go exactly as planned. There are always issues that present a challenge. The question is who is in your corner to make sure that those issues are attended to and that they get done in a timely manner. My name is Peter Westbrook and I am a local cash home buyer in Stockton, Manteca, Modesto and Sacramento CA. 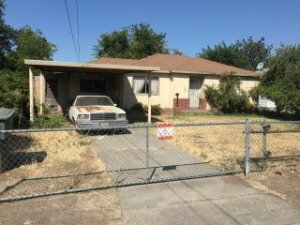 We Buy Houses in any condition and if you have a house to sell call me at (209)481-7780. I know that I can help you. With nearly 35 years of business experience, nearly 10 years of real estate investing and 100’s of real estate transactions, I can present solutions that most others have never even heard of. I understand that not every situation is the same and sometimes we need to tailor make our solutions to best fit your needs. Whether you call me or not visit my website at http://www.IBuyHousesStockton.com and see how I have helped 100’s of local families just like yours.